Barry Fry reckons he’s in for his toughest summer in 20 years at Posh. The director of football has been charged with off-loading several unwanted members of the first-team squad so manager Grant McCann can assemble a team capable of challenging for League One honours next season. 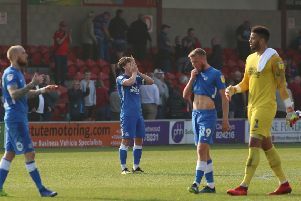 The club’s cashflow situation and the Football League’s financial fairplay rules means players must be sold before any more new players can come in. Posh are £57k down on season ticket revenue compared to this stage last season having sold 300 fewer tickets. “We must clear the decks to be able to start again,” Fry said. “We are not in a position to offer improved contracts to current players or to sign new players until we’ve got rid of a few players. “We have sold fewer season tickets than this time last year and we can only spend 60% of our income on players’ wages because of financial fair play.